Is This The World's Most Coveted Painting? The Ghent Altarpiece is one of the world's most famous — and most frequently stolen paintings. Not bad for a monumental work of art that's the size of a barn door and the weight of two elephants. It's the size of a barn door, weighs more than an elephant, and is one of the most famous and coveted paintings in the world. It's the Ghent Altarpiece -- also called Adoration of the Mystic Lamb, after a central panel showing hordes of pilgrims gathered to pay homage to the Lamb of God. Other panels depict the Annunciation, Adam and Eve, the Virgin Mary, John the Baptist and a crowned Christ in detail so exacting that you can pick out individual hairs in a beard, or dirt on a pilgrim's foot. Artist Jan van Eyck completed the Ghent Altarpiece around 1432. Author Noah Charney tells NPR's Guy Raz that it's arguably the single most important painting ever made. "It's the first great oil painting -- it influenced oil painting for centuries to come," Charney says. "It's the first great panel painting of the Renaissance, a forerunner to artistic realism. The monumentality of it and the complexity of it fascinated people from the moment it was painted." 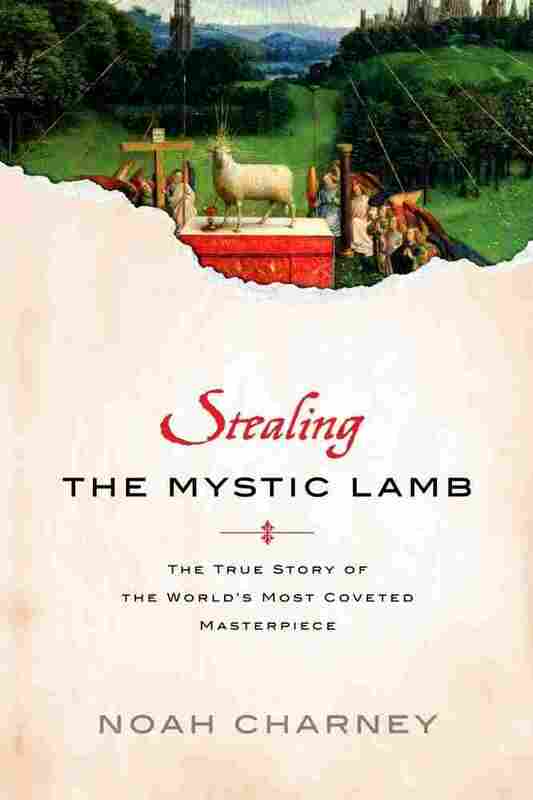 Charney's new book, Stealing the Mystic Lamb: the True Story of the World's Most Coveted Masterpiece, traces the painting through six centuries of war, theft and intrigue. When World War I broke out, a brave cathedral canon hid the painting away in a junkman's wagon for safety. It took the Treaty of Versailles to finally reunite all the panels in their original home. The Ghent Altarpiece didn't stay safe for long. Thieves broke into the cathedral one night in 1934 and made off with the lower left panel. Noah Charney is also the author of Art and Crime: Exploring the Dark Side of the Art World and The Art Thief: A Novel. "This is the enduring mystery that really is part of the popular cultural awareness of the people of Ghent still to this day," Charney says. "This may sound very silly," says Charney, "but in fact, the Nazis and Hitler in particular were absolutely convinced that the occult and the supernatural was real," and the Ghent Altarpiece was thought to be a sort of mystical treasure map showing the location of relics of Christ's passion. Charney says the Ghent Altarpiece was eventually saved through the heroism of salt miners who disabled the bombs, and the work of local Austrian resistance fighters and Allied "monuments men" whose job it was to hunt for stolen art. "There was this race," Charney says, "with the Allies trying to get to the mine before the SS could blow it up, and it was very close to every one of those works being completely destroyed." But the painting was saved, and you can see it today at the St. Bavo Cathedral in Ghent. "Each time I see it, I notice something new," Charney says. "For instance, I think it may be the first work of the pre-modern period to show someone laughing." As the oak door to the chapel swings open, one is first struck by the scents: the cool, ancient stone of the walls of Saint Bavo Cathedral, the smell of frankincense, and then the surprising notes of old wood, linseed oil, and varnish. The cathedral in Ghent, Belgium, abounds with stunning religious art, but one artwork stands out among the rest. After six hundred years of nearly constant movement, The Ghent Altarpiece is at last back in the cathedral for which it was painted. Jan van Eyck's masterpiece has been involved in seven separate thefts, dwarfing the next runner-up, a Rembrandt portrait, lifted from London's Dulwich Picture Gallery on a mere four occasions. From enduring questions surrounding the movement, through theft and smuggling, of the altarpiece as a whole to the mystical symbolism of its content, the altarpiece has haunted scholars and detectives, hunters and protectors, interpreters and worshippers. It is one of art history's great unsolved mysteries. Those who stand before the altarpiece cannot but feel overwhelmed by its monumentality. 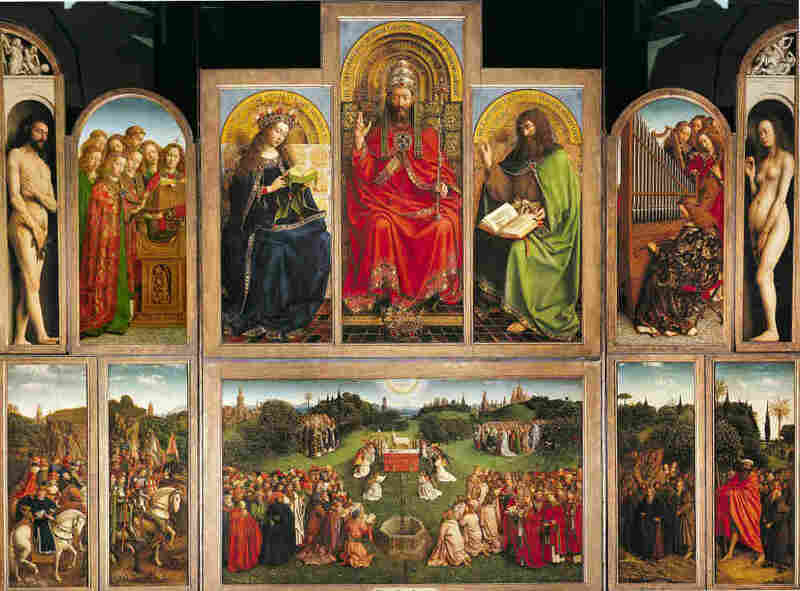 The Ghent Altarpiece comprises twenty individual painted panels linked in a massive hinged framework. It is opened on its hinges for religious holidays but remains closed for most of the year, at which point only eight of the twenty panels, which were painted on both recto and verso (front and back sides), are visible. The subject matter of the verso panels, visible when the altarpiece is closed, is the Annunciation: The angel Gabriel tells Mary that she will bear the Son of God. Portraits of the donors who paid for the altarpiece, and their patron saints, also grace the back. The altarpiece has a puzzle-box appearance, and inside its treasures lie patiently in wait for decipherers. When open, the altarpiece's center displays an idealized field full of figures: saints, martyrs, clergy, hermits, righteous judges, knights of Christ, and an angelic choir, all making a slow pilgrimage to pay homage to the central figure -- a Lamb on a sacrificial altar, standing proudly, while it bleeds into a golden chalice. This scene is referred to as "The Adoration of the Mystic Lamb." The precise iconographic meaning of the Adoration of the Mystic Lamb panel and the meaning of the dozens of obscure symbols within it have been the subject of centuries of scholarly debate. Above the vast field of the Adoration of the Mystic Lamb, in the upper panels, God the Father sits enthroned, with Mary and John the Baptist on either side. The figure has a hand raised in blessing, a hand painted with an astonishing realism: veins bulge and tiny hairs curl out of the pore-scored skin. At his foot, a crown is clustered in light-reflecting jewels; the fringe of his cloak is woven in gold threads, and above his head arch rune-like inscriptions. Individual hairs were lovingly painted into his beard, and his almond eyes express a power and a weariness that are altogether human. The level of minute detail in so enormous an artwork is unprecedented. Until the altarpiece was painted, only portrait miniatures and illuminated manuscripts contained such detail. Nothing like this intricacy had ever been seen before on such a grand scale, by artists or admirers. The great art historian Erwin Panofsky famously wrote that van Eyck's eye functioned "as a microscope and a telescope at the same time." Viewers of The Ghent Altarpiece, Panofsky explained, are privy to God's vision of the world, capturing "some of the experience of Him who looks down from heaven, but can number the hairs on our head." In The Ghent Altarpiece jewels shine with refracted light. One can see individual hairs on the manes of horses. Each of the altarpiece's hundred-plus figures have been given personalized facial features. Each figure's face is unique and retains the detail of a portrait -- sweat, wrinkles, veins, and flared nostrils. Details range from the mundane to the elegant. Viewers can make out tufts of grass, the wrinkles in an old worm-eaten apple, and warts on double chins. But they can also see the reflection of light caught in a perfectly painted ruby, the folds of a gilded garment, and individual silvery hairs amid the chestnut curls of a beard. The secret weapon that permitted such detail was oil paint. Because oil paints are translucent, artists can build up layer upon layer, without covering up what lies beneath. The preferred medium before van Eyck's time, egg-based tempera, was essentially opaque. One layer blotted out the previous one. Oil allowed for a great deal more subtlety and was also easier to control. Van Eyck used some brushes that were so small as to contain only a few animal hairs for bristles, permitting an entirely new level of intricacy. The result is a visual feast, a galaxy of painterly special effects that at once dazzle and provide days of viewing interest, prompting viewers to examine the painting from afar and up close, to decipher as well as to bask in its beauty. The Ghent Altarpiece, the young van Eyck's first major public work, was also the first large-scale oil painting to gain international renown. Though he did not invent oil painting, van Eyck was the first artist to exploit its true capabilities. The artistry, realistic detail, and use of this new medium made the artwork a point of pilgrimage for artists and intellectuals from the moment the paint dried and for centuries to come. The international reputation of the painting and its painter, particularly taking into account its establishment of a new artistic medium that would become the universal choice for centuries, makes for a strong argument that The Ghent Altarpiece is the most important painting in history. It is a work of art that centuries of collectors, dukes, generals, kings, and entire armies desired to such an extent that they killed, stole, and altered the strategic course of war to possess it. From Stealing the Mystic Lamb by Noah Charney. Reprinted by arrangement with PublicAffairs, a member of the Perseus Books Group.